مدیرى, مهدى. (1392). اشاره - ایجاد پایگاه داده ای مکانی. فصلنامه علمی- پژوهشی اطلاعات جغرافیایی « سپهر», 22(85-1), 2-12. مهدى مدیرى. "اشاره - ایجاد پایگاه داده ای مکانی". 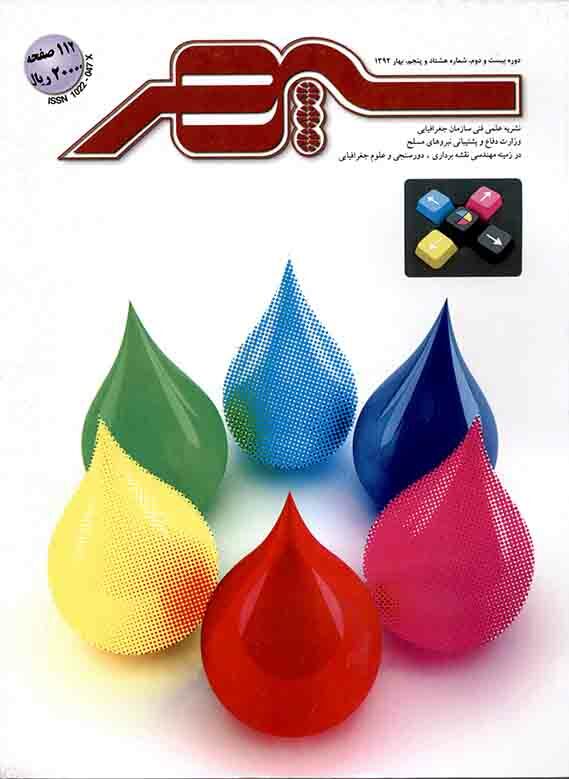 فصلنامه علمی- پژوهشی اطلاعات جغرافیایی « سپهر», 22, 85-1, 1392, 2-12. مدیرى, مهدى. (1392). 'اشاره - ایجاد پایگاه داده ای مکانی', فصلنامه علمی- پژوهشی اطلاعات جغرافیایی « سپهر», 22(85-1), pp. 2-12. مدیرى, مهدى. اشاره - ایجاد پایگاه داده ای مکانی. فصلنامه علمی- پژوهشی اطلاعات جغرافیایی « سپهر», 1392; 22(85-1): 2-12. اطلاعات مواد اصلی تحقیقات علمی، و نتیجه بخش بودن پژوهش در گرو پردازش اطلاعات است.طبیعی است که در اختیار داشتن فناوری و ابزاری با این ابعاد و ویژگی، تحولاتی بنیادین را در عرصۀ پژوهش های علمی ایجاد کند. عکس های هوایی رقومی و تصاویر ماهواره ای؛ اطلاعات بارندگی و نقاط هم بارش؛ اطلاعات سرزمین های مرطوب و خشک، اطلاعات خاک و نوع مقاوت خاک؛ نقشه آلودگی های رادیولوژیکی، آب ، خاک ، هوا و...؛ مدل سه بعدی رقومی زمین (DEM)1؛ پوشش گیاهی و گونه شناسی؛ اطلاعات توپوگرافی و شیب منطقه؛ اطلاعات جمعیتی وتراکم جمعیت؛ اطلاعات شبکه دسترسی، اطلاعات رقومی شده تأسیسات و زیرساخت ها؛ وضعیت آبخیز و آبخوان در منطقه (شناسایی مسیل ها و رودخانه ها)؛ وضعیت آب های سطحی و زیرزمینی؛ وضعیت زمین شناسی و ژئوتکتونیک در منطقه؛ اطلاعات گسل های شناسایی شده در منطقه. اطلاعات دیگر شامل اطلاعات جدول آب، عمق آب زیر زمینی، جغرافیایی سطح و . . . بر حسب موضوع جهت برنامه ریزی شهری (مکانیابی، طراحی و ساخت) مورد ارزیابی قرار می گیرند. پس از جمع آوری اطلاعات ذکر شده ، مراحل ذخیره سازی ، سازماندهی در نرم افزارهای GIS انجام و بستر پایگاه دادهای فراهم می شود. در سامانه های اطلاعات جغرافیایی، اطلاعات فضایی که شامل داده های مکانی و اطلاعات توصیفی هستند به عنوان پوششی برای داده های برداری راستری(سلولی) ذخیره می شوند. خصوصیات هرمدل اطلاعاتی باید قبل از ترکیب درسیستم انتخابی سایت مورد توجه قرارگیرد . ب ) روش شیءگرا و بر اساس موقعیت مکانی پدیده ها (هوشمند سازی پدیده ها). در سیر تحول اتوماسیون از تولید رقومی عناصر گرافیکی و توانایی ترکیب، تجمیع، تنسیق، تصحیح، بارزسازی و به هنگام نمودن به ایجاد پایگاه دادهای مکانی و جغرافیایی و هوشمند سازی اجزا و عناصر گرافیکی دست یافته به طوری که علاوه بر توانایی اطلاعات رقومی، شرایط انتخاب و تصمیم گیری منطقی را دارا می باشد. Information is the main ingredient of scientific research and an efficacious research depends on information processing. Naturally, such a tool and environment with such dimensions and features creates fundamental changes in the realm of scientific researches. Digital aerial imagery and satellite pictures, precipitation data and isohyet points, information about humid and arid lands, soil and its resistance, map of radiologic pollution, water/soil/weather pollution, digital earth model (DEM), vegetation and typology, topographic information and slope, population information and density, access network information, digitalized information of infrastructure and facilities, the situation of watersheds and aquifers in the area (identifying streams and rivers), ground and underground waters, geologic and geotectonic situation of the area, information related to the known faults in the area. Other information like water table information, depth of underground water, geography of surface, etc. are evaluated according to the subject and used in urban planning, locating, designing and constructing. After collecting the mentioned information, saving and organizing are performed in GIS environment and data base platform. In geographic information systems, spatial data and descriptive information are stored as a coverage for vector and raster data. Features of each information model should be considered before being integrated in the selected site system. In the process of evolution, automation reached from digital production of graphical elements and the ability to integrate, aggregate, regulate, correct, distinguish and synchronize to create spatial and geographic data base and smartification of the graphic components. So that in addition to the ability of producing digital information, it has the necessary conditions for selection and logical decision making. 2) Brewer, C., (2005) Designing Better Maps. ESRI Press. 3) Câmara, G., Fonseca, F., Monteiro, A.M., Onsrud, H., (2006) Networks of innovation and the establishment of a spatial data infrastructurein Brazil. Inf. Technol. Dev. 12, 255–272. 4) DeMers, M., (2005) Fundamentals of geographic information systems, 3rd ed. John Wiley & Sons, New York. 6) Malczewski, J., (2006) GIS-based multicriteria decision analysis: a survey of the literature. International Journal of Geographical Information Science 20 (7), 703–726. 7) Star. J and Estes. J., (1990) Geographic Information Systems, An Introduction. PrenticeHall, Englewood Cliffs, NJ. 8) Zeiler, M., (1999) Modeling our World—The ESRI Guide to Geodatabase Design. ESRI Press, Redlands, Ca. 9) MacEachren. A. M, and Taylor. D. R. F. , editors. ( 1994) Visualization in Modern Cartography. Pergamon Press, London, U.K.
11) Goodchild. Michael F. (1996) Geographical information science. Int. J. Geographical Longman, London, U.K.
12) Worboys. Michael F (1995) GIS: A Computing Perspective. Taylor & Francis, London, U.K.
13) Wolfgang Kainz. Logical consistency. In S.C. Guptill and J.L. Morrison,editors,(1995) Elements of Spatial Data Quality, pages 109–137. Elsevier Science,Oxford, U.K.
14) Robinson. A. H., Morrison. J.L, Muehrcke. P. C, Kimerling. A. J and Guptill. S. C. (1995) Elements of Cartography. John Wiley & Sons, New York, NY, sixthedition.